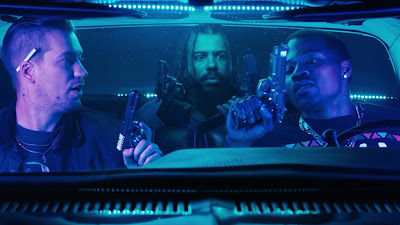 The first time I saw the trailer for Blindspotting, I was a little confused as to what it was. The trailer begins by making you think it is some sort of comedy and ends looking more like a drama on race relations and perceptions. As it turns out, the movie is both. We follow a young man whose parol is nearly up, navigating the complicated relations and his own changing perceptions in the wake of witnessing a police shooting. Now, I do not have the words for a full review, but I at least wanted to share some of my immediate reaction in the wake of seeing it. 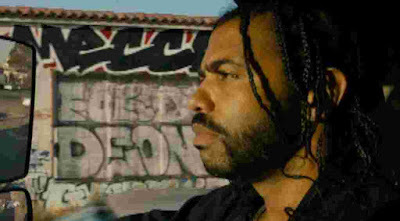 The movie is quite incredible in how it weaves this narrative of the interracial best friends and how one friend changes as his parole comes to a close. There is a lot of serious introspection going on and it all builds to a powerful confrontation at the climax that is handled in a way that I have never seen before. Throughout all of the important and timely points, the movie still manages to be fun and entertaining. It is a wonderful blend of comedy and drama that mirrors the complexities of the real world. This is the sort of movie that will stay with you long after it ends. The movie was co-written by its two leads, Daveed Diggs (Broadway’s Hamilton) and Rafael Casal. 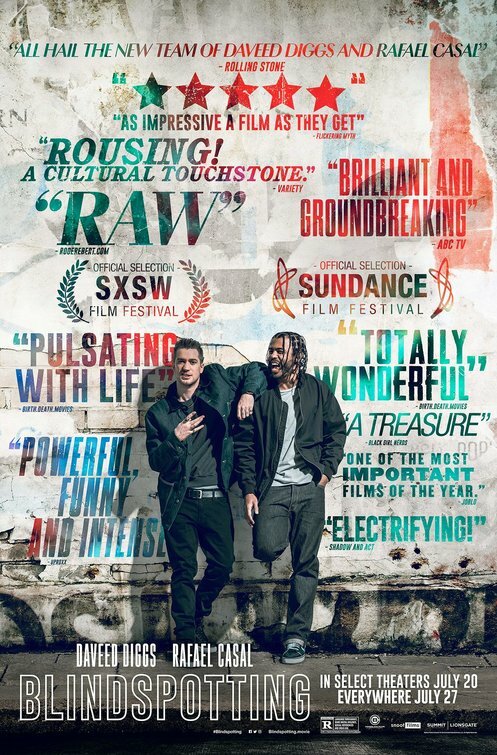 The story deftly dances around race relations, life for of an ex-con, dealing with the stupidity of youth, maturing, and life where nothing is a given and you are made to feel like an outsider in your own town. Their characters make me smile, cringe, and adjust my own perceptions. It was directed by Carlos Lopez Estrada, his first feature, and he employs a minimalist style, letting screenplay and the actors tell the story. It is a wise choice as this is very much a character driven film. Really, the only thing that feels out of place is the friend in car with the giant wheels. Blindspotting has a lot going on. 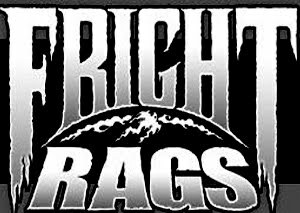 Collin (Diggs) is nearing the end of his probation, he witnesses a police shooting, it rightfully haunts him. How can he say anything? It was past his probationary curfew and he is seen as little more than a convict. He has a white friend who constantly tries to prove his “ghettoness.” He works with his ex-girlfriend who left him when he went to jail. They both live in a fast gentrifying Oakland. There really is a lot to process and having it presented through Collin’s point of view is fascinating. Decisions, choices, consequences, seeing what you want to see. Everything can change in the blink of an eye. The way your mind processes the input can forever color your perception, it can taint the outcome, but if you work you can change the way you process. Things can change they don’t have to stay the same. The way the Blindspotting deals with its plot points is extremely well done, it is subtle, sometimes disguised in a joke or some humor. It is mostly not in your face and blatant. That doesn’t mean it doesn’t ratchet up the tension when necessary. Everything guts dialed up in afew intense interactions towards the end of the film. The somewhat inevitable face off is handled so well and so unlike what I have seen before, it grabs you and holds you as it stares you in the face and implicates you. It was a moment that get into my emotions. There is one other moment, also in the latter portions of the film that is telling about our society. I won’t say what it is, but it is a quiet scene with no dialogue. It is filled with tension and I was wrapped up in it, gripping the arms of my seat waiting to see what would happen. You will know it when you see it. 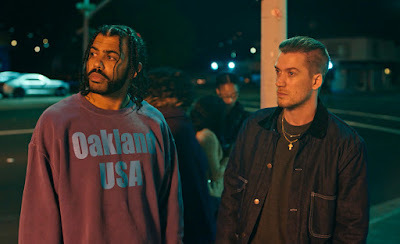 Blindspotting exceeded my expectations. The blend of drama and humor, the presentation of characters, the way it swerved in unexpected directions, it is one to be seen, to be savored, and to be thought about. I guess I had more to say than I thought.